The Irish tweeted about everything from lapgate to Anglotapes, Seamus Heaney to the Late Late (among other things). A BIT OF “horseplay” in the Dáil, an irascible TV presenter, tragic deaths and memories of primary school: these are among the main obsessions of the Irish Twitter community in 2013. The topics which got Irish users going on the social media platform this year range from sporting events to politics to TV and nostalgia for Irish slang. Big note of context here: Twitter Ireland say that they have ranked the following top tens to reflect what trended most often, rather than the volume of tweets about a particular topic. So you might say these are the things that we most consistently got worked up about. 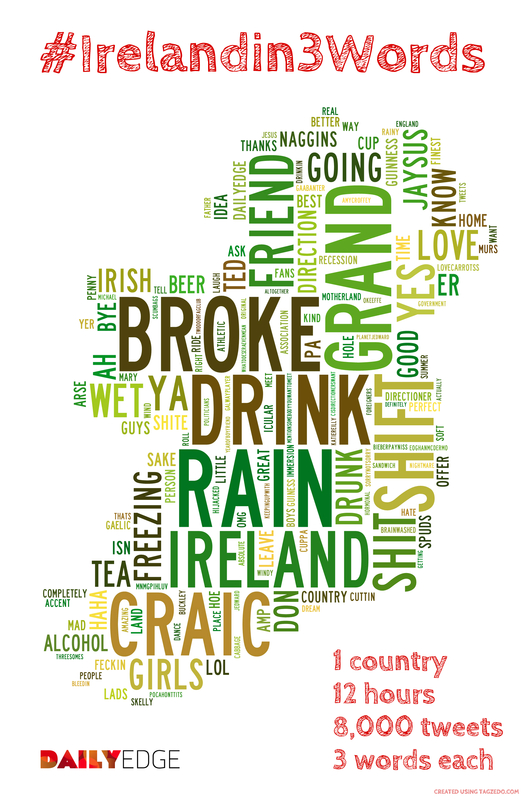 #irelandin3words (you might recognise this as a hashtag started by our pals on DailyEdge.ie – it became so popular they made this map of Ireland out of your tweets under that tag. On a global level, the interest in celebrities’ Twitter accounts continued. The next three most popular tweets came from One Direction band members. Tops was Mullingar’s Niall Horan, of course. His bandmate Zayn Malik snaffled the next two – here and here. The whole of Twitter’s report from 2013 just now went live on 2013.twitter.com. Updated 09.29: Twitter updated ‘Irish people’ list to remove Joe Hart, and include Joe Brolly. Email “In #BOD and #vinb we trust: Ireland on Twitter in 2013”. Feedback on “In #BOD and #vinb we trust: Ireland on Twitter in 2013”.